Description: This tutorial teaches FIWARE users about context data and context providers. The tutorial builds on the Store entity created in the previous stock management example and enables a user to retrieve data about a store which is not held directly within the Orion Context Broker. Within the FIWARE platform, an entity represents the state of a physical or conceptual object which exists in the real world. For example, a Store is a real world bricks and mortar building. The context data of that entity defines the state of that real-world object at a given moment in time. The name of the store e.g. "Checkpoint Markt"
The address "Friedrichstraße 44, 10969 Kreuzberg, Berlin"
As you can see, most of these attributes are completely static (such as the location) and the others are unlikely to be changed on a regular basis - though a street could be renamed, or the store name could be rebranded. This information is always changing, and if it were statically held in a database, the data would always be out-of-date. To keep the context data fresh, and to be able to retrieve the current state of the system on demand, new values for these dynamic data attributes will need to be retrieved whenever the entity context is requested. Smart solutions are designed to react on the current state of the real-world. They are "aware" since they rely on dynamic data readings from external sources (such social media, IoT sensors, user inputs). The FIWARE platform makes the gathering and presentation of real-time context data transparent, since whenever an NGSI request is made to the Orion Context Broker it will always return the latest context by combining the data held within its database along with real-time data readings from any registered external context providers. Currently, the Orion Context Broker relies on open source MongoDB technology to keep persistence of the context data it holds. To request context data from external sources, we will now need to add a simple Context Provider NGSI proxy. returns context data back to the Orion Context Broker in NGSI format. Since all interactions between the elements are initiated by HTTP requests, the entities can be containerized and run from exposed ports. The other tutorial container configuration values described in the YAML file are not used in this tutorial. A simple Node.js Express application has been bundled as part of the repository. 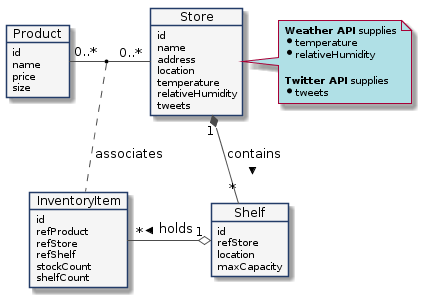 The application offers an NGSI v1 interface for four different context providers - the Open Weather Map API, the Twitter Search API and two dummy data context providers - a static data provider (which always returns the same data) and a random data context provider (which will change every time it is invoked). In order to access the Twitter Search API, you will have to create an app in Twitter via https://developer.twitter.com/ to obtain a Consumer Key & Consumer Secret. If you do not wish to sign-up for an API key, you can use data from the random data context provider instead. This command will also import seed data from the previous Stock Management example on startup. Tip You can also watch the status of recent requests yourself by following the container logs or viewing information on localhost:3000/app/monitor on a web browser. The Node.js proxy application offers a health endpoint for each of the four context providers. Making a request to the appropriate endpoint will check that the provider is running and external data can be received. The application runs on port 3000. This example returns the health of the Static Data Context Provider endpoint. A non-error response shows that an NGSI proxy is available on the network and returning values. Each Request will return the same data. This example returns the health of the Random Data Generator Context Provider endpoint. A non-error response shows that an NGSI proxy is available on the network and returning values. Each Request will return some random dummy data. This example returns the health of the Twitter API Context Provider endpoint. 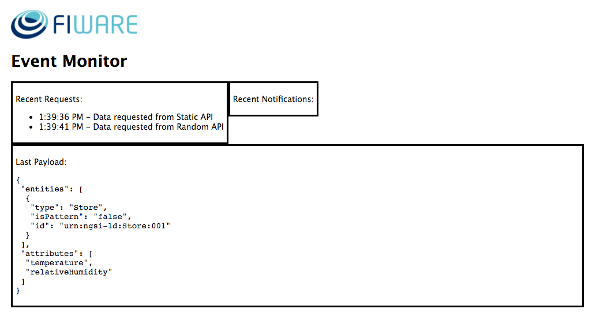 A non-error response shows that an NGSI proxy for the Twitter API is available on the network and returning values. If the proxy is correctly configured to connect to the Twitter API, a series of Tweets will be returned. To get Consumer Key & Consumer Secret for the Twitter API, you have to create an app in Twitter via https://developer.twitter.com/. Then you'll be taken to a page containing Consumer Key & Consumer Secret. As you can see details the text of each tweet is available within the statuses array. Because the 3000 port of the Context Provider has been exposed outside of the Docker container, it is possible for curl to make requests directly to the Context Provider - this simulates the requests that would have been made by the Orion Context Broker. You can also simulate making the requests as part of the docker container network by running the appropriate/curl Docker image. As you can see, within the network, the hostname of the Context Provider is context-provider. This example uses the NGSI v1 queryContext endpoint to request a temperature reading from the Static Data Generator Context Provider. The requested attributes are found within the attributes array of the POST body. The Orion Context Broker will make similar requests to this queryContext endpoint once a context provider has been registered. The response will be in NGSI v1 response format as shown. The attributes element holds the data returned - an object of type:Number with the value:42. It is possible for the Orion Context Broker to make a request for multiple data values . This example uses the NGSI v1 queryContext endpoint to request temperature and relativeHumidity readings from the Random Data Generator Context Provider. The requested attributes are found within the attributes array of the POST body. This example registers the Random Data Context Provider with the Orion Context Broker. The body of the request states that: "The URL http://context-provider:3000/proxy/v1/random/weatherConditions is capable of providing relativeHumidity and temperature data for the entity called id=urn:ngsi-ld:Store:001." The values are never held within Orion, it is always requested on demand from the registered context provider. 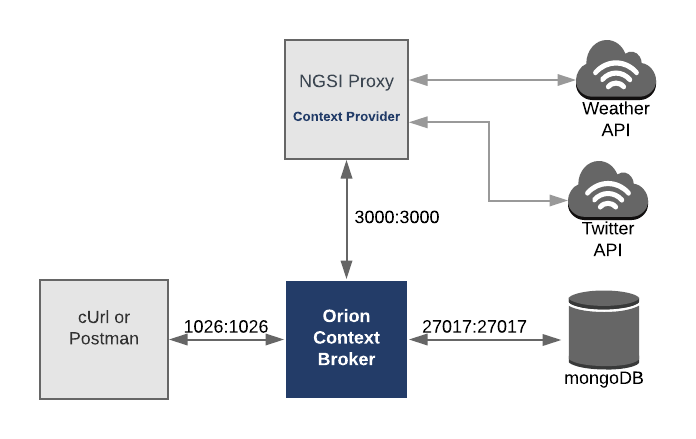 Orion merely holds the registration information about which context providers can offer context data. The presence of the flag "legacyForwarding": true indicates that the registered context provider offers an NGSI v1 interface - therefore Orion will make POST request for data on http://context-provider:3000/proxy/v1/random/weatherConditions/queryContext using the NGSI v1 format for the body, and expect to receive data in the NGSI v1 format in return. This example reads the registration data with the ID 5addeffd93e53f86d8264521 from the context. Registration data can be obtained by making a GET request to the /v2/registrations/<entity> endpoint. Full context data for a specified entity type can be retrieved by making a GET request to the /v2/registrations/ endpoint. Registrations can be deleted by making a DELETE request to the /v2/registrations/<entity> endpoint.